Ref: 10162 - free shipping above 40€, WORLDWIDE only if under 50 gr. total = 300 chromo cards Liebig, original and good condition ! Sie sollen zufrieden sein ! here are all the fotographs, of all sets in several albums. 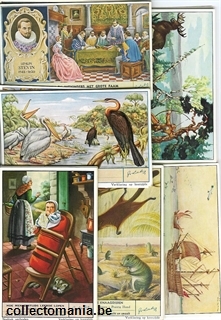 I receive regulary mails from buyers of the “50 sets Liebig trade cards packages”, and they ask me how to complete the Flemish 538sets collection from 1918 tot1962. -	You can also pay me with credit card and that we can handle by mail ( just send me the numbers you need Now, to make it easy … and buy at a good price as a regular client … your discount is subtracted because I will use dollars for the amount in Euros … that is a 30percent discount on the price indicated in Euros on this website … only for the sets from 1918 tot 1962 Belgian edition. 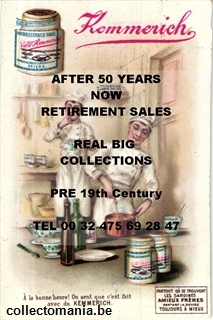 Valid until end 2013 All sets will be vintage and in a VERY GOOD condition, complete and beautifull as you constated when evaluating the first package. Another important thing to know is that we have 2 languages in Belgium : French and Flemisch. You will notice that sometimes the value in one language is triple or more. So when the language is not important then you can choose for the cheaper price! Design on the cards are just them same. So when you send a Paypal list, join another email apart with some more sets of your choice adding up to 30 procent of the amount to pay. On this website you will see the whole collection if browsing around. All sets with a Paypal flag can be bought at same condition to you … but don’t use Paypal immediately for expensive sets because some of these I have only once or twice and when buyers are to many the system can collapse and then you must start again. I cannot change that. Sorry about that I hope you understand the tekst above because, as you now English is not my mothers language and that can be quite confusing, so I appoligize for that. Please send me your questions, I will be glad to answer them.